If you start the video below and then go browse in another tab, leaving the audio running, you’ll probably swear you’re listening to some weird but beautiful electronic music. 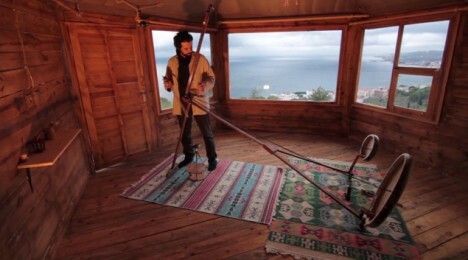 But the sounds are actually produced by the Yaybahar, an acoustic stringed instrument invented by Turkish musician Görkem Şen. 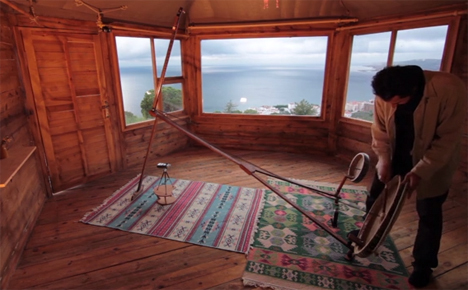 The bonkers instrument is completely electricity-free and made of springs, strings, and frame drums. Vibrations from the strings travel down the coiled springs to the frame drums, where they are turned into sounds that bounce back and forth on the springs. Şen plays the Yaybahar by drumming on the frame drums, smacking the horizontal springs, and strumming or plucking the vertical strings. The sounds it makes are otherworldly. They range from light and melodic to deep and ominous; thanks to the nature of the instrument the sounds resonate for sustained periods and create layers upon layers of sound. The performance in the video was filmed in real time with no special effects or post processing. Watch the video until the end and you’ll hear the musician sneak in a bit of “Ode to Joy” just to make music nerds squeal with delight. See more in Art of Tech or under Technology. January, 2015.